KABUL, Afghanistan - The deadliest insurgent attack since the US-led invasion of Afghanistan in 2001 destroyed a bus full of police instructors at Kabul's busiest transportation hub on Sunday, killing 35 people and wounding 52, officials said. The explosion was the fifth suicide attack in Afghanistan in three days, part of a sharp spike in violence around the country. In the south, in Kandahar province, a roadside bomb killed three members of the US-led coalition and an Afghan interpreter. The soldiers' nationalities were not released, but most in the coalition are American. Condemning the Kabul attack, President Hamid Karzai said the "enemies of Afghanistan" were trying to stop the development of Afghan security forces, a key component in the US- NATO strategy of handing over security responsibilities to the Afghan government one day, allowing Western forces to leave. At the entrance to the hospital, a blue plastic trash can overflowed with the bloodied shoes and sandals of victims. Afghan government officials, police and army soldiers are commonly targeted by insurgents trying to bring down Karzai's US-backed government, and buses carrying Afghan police and army soldiers are common targets. 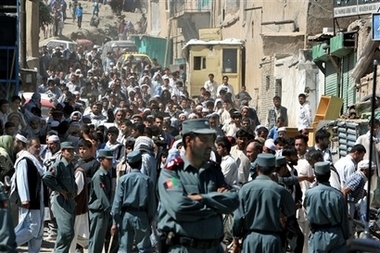 At least 307 Afghan police, army or intelligence personnel have been killed in violence so far this year through June 15, according to an AP tally of figures from the US, UN, NATO and Afghan authorities. Insurgency-related violence has killed more than 2,400 people in Afghanistan this year, mostly insurgents, according to an AP count based on figures from US, NATO, UN and Afghan officials.